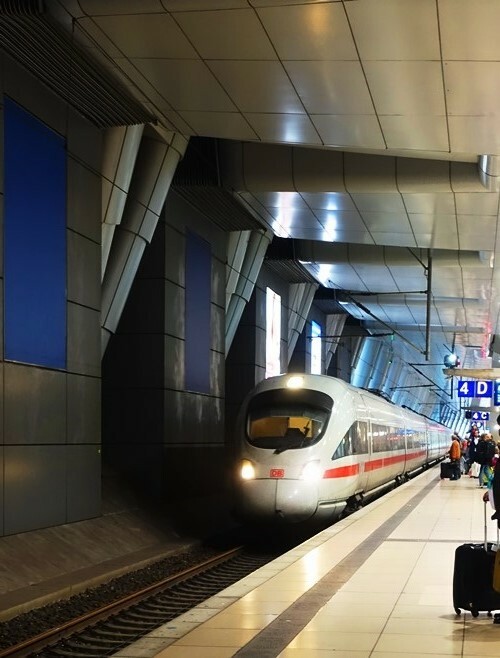 When I go to Germany I always take the train from the airport in Germany. I don’t want to mess with renting a car and driving long distances after a long flight. I usually am visiting Jena when I go to Germany and it is a relaxing train journey during which I usually get a bit of a nap. 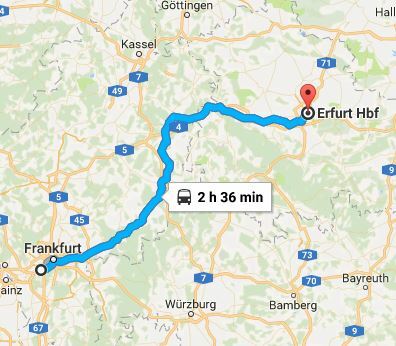 I usually take an ICE train from Frankfurt to Erfut that takes a little more than two and a half hours. There is a train about every hour or two so even if my flight is a bit late I am quickly on a train. From Erfurt I then take a much slower regional train that takes about 35 minutes. My usual flight lands at about 2:30 in the afternoon and I am usually in Jena before 8 in the evening. After landing in Frankfurt yesterday after My Last United 747 Flight I headed toward immigration. Unfortunately the lines at immigration were long and there were only a few agents working. However, when I got to baggage claim I did not have to wait as my bag had probably been there for 30 minutes. When I got out to the train station I was trying to buy my ticket from a machine and couldn’t find my train. 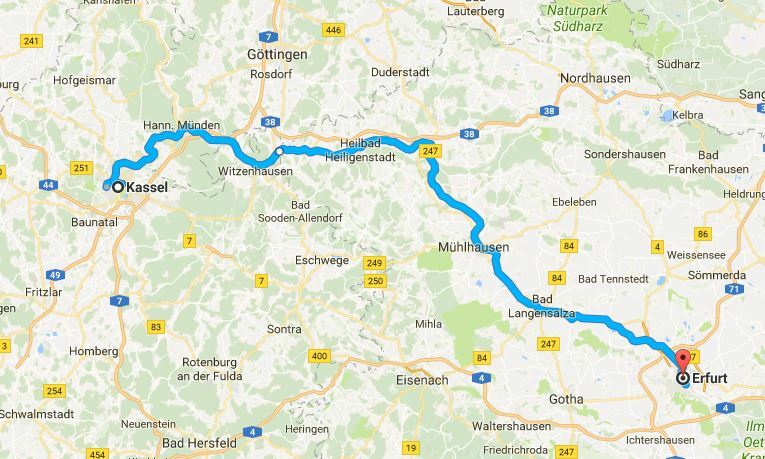 I went to the customer service center and found out that the ICE route between Fulda and Erfurt was closed for maintenance. 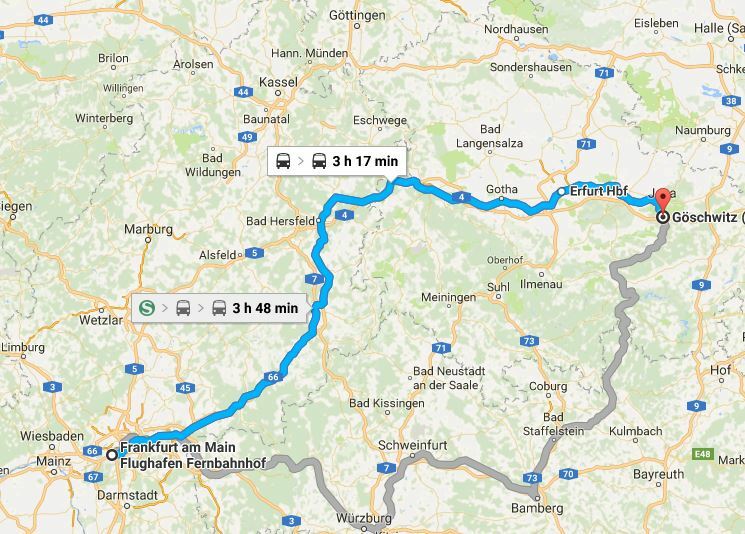 The agent then helped me with my ticket and said that it was going to take me almost six hours to get to Jena. The first part of my journey was on an ICE which passed through Fulda and then on north to Kassel-Wilhelmshöhe. Unfortunately I had to wait more than an hour for the train as I had missed the previous one by about 10 minutes. The first part of the trip was 1 hour and 46 minutes and we reached speeds up to 226 kph (140 mph). A nice fast comfortable ride. The next part of the journey was on a regional train from Kassel-Wilhelmshöhe to Erfurt. This is a journey of about 90 miles and it took 2 hours and 17 minutes. It may have been a nice relaxing journey if it had been daytime and I could see the passing countryside. Instead, it was dark and the only time you could see outside was when we stopped at the many stations along the way. Instead I kept dozing off between stations and the occasional buzz of my phone as I got new e-mails. 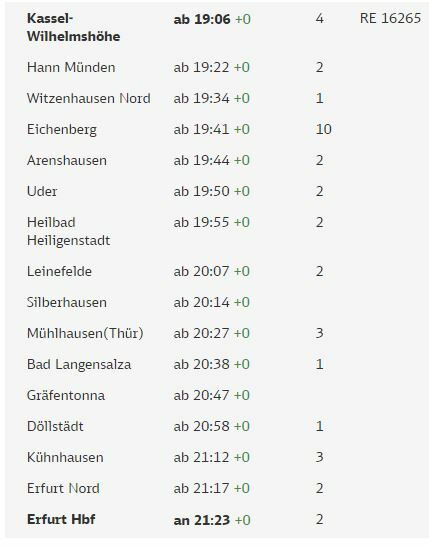 Unfortunately none were from someone I wanted to hear from 🙂 The train made 15 stops including the final one in Erfurt. 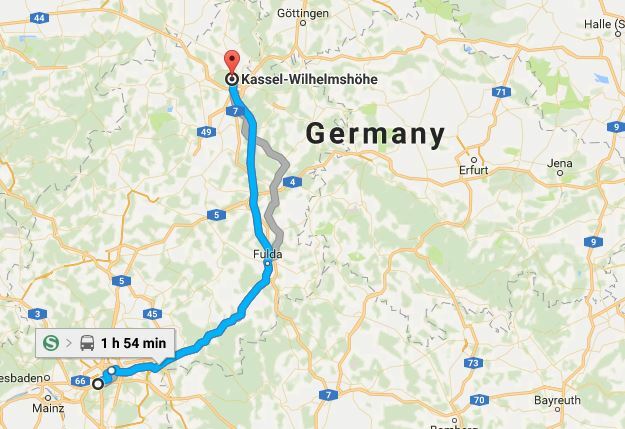 I don’t think I had heard of any of these towns before except for Kassel and Erfurt. 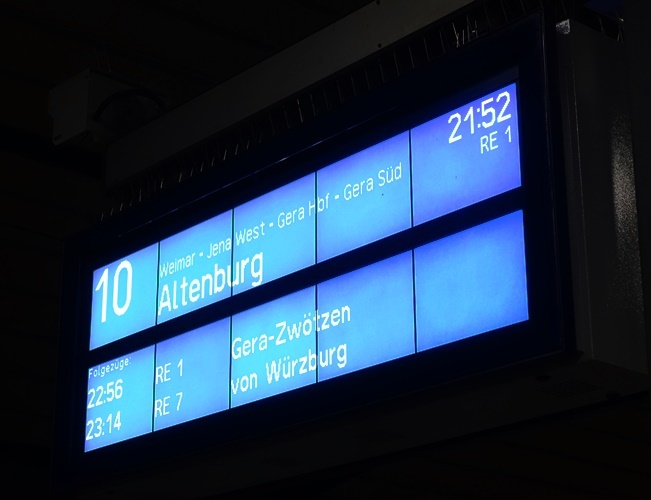 I then had almost 30 minutes to wait for the next train that would take me to my Jena. By this time I was really hungry so stopped at the McDonalds in the Erfurt station and picked up a double cheeseburger. Finally we were on the way and we crawled toward Jena. I had some interesting people sitting near me and they were interesting to observe. At least they kept me awake. We finally made it to the Jena-Göschwitz station. This picture was taken during my last trip. It was much darker when we arrived last night as it was almost 10:30. It was dark and rainy. Since it was raining I knew that it would not be wise to walk to the hotel, so I had to wait for the next street train. Unfortunately this late at night they only come by every 30 minutes. I had missed the train by about five minutes so had a long wait. Fortunately the track maintenance was only this weekend and on Friday it will only take me about three and a half hours to get to the airport. This entry was posted in Germany, Travel and tagged Deutsch Bahn, Erfurt, Fulda, Fulda Gap, Jena, Kassel, train delays, train ride, trains. Bookmark the permalink.